Fireye ​PARAGON™ (105F1-1) FLAME SCANNER - FIREYE-Flame Scanners - Honeywell,Micro Motion,Rosemount-Shanghai Wanchang Industrial Co. INTEGRATED SCANNERSFireye® provides a variety of UV and IR flame scanners which accurately detect the presence or absence of flame in a combustion chamber. Our scanners include advanced sensors and algorithms that can discriminate its target burner from adjacent flames in the same combustion chamber. Our scanners can be used with all fuel types and burner configurations. Our InSight and Phoenix families are integrated designs which include all the appropriate detection and amplification circuitry in one compact unit. Fireye provides a variety of UV and IR flame scanners with both self-check and non-self check capabilities. These scanners require a separate amplifier for single burner or multi-burner applications. The following Fireye flame scanners are used in conjunction with the appropriate Fireye flame safeguard controls to provide reliable flame detection on a variety of burner applications and fuel types. 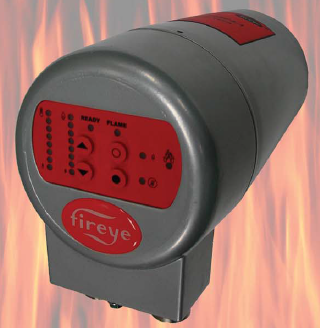 Anywhere you are trying to safely control a flame, you will find a Fireye control. Fireye® provides a variety of flame scanners which accurately detect the presence or absence of flame in a combustion chamber. Our scanners include advanced sensors and algorithms that can discriminate its target burner from adjacent flames in the same combustion chamber. Our scanners can be used with all fuel types and burner configurations. Our InSight Scanners® and Phoenix families are integrated designs which include all the appropriate detections and amplification circuity in one compact unit. PARAGON™ (105F1-1) FLAME SCANNER Type 105F1-1 Integrated Flame Scanner and Temperature Analyzer. Paragon scanner provides high integrity sensing of multiple flame properties, including Amplitude, Flicker Frequency and Flame Learned vs. Stored Curve Fitting.